Not every outing will be successful, and my first Canada goose hunt on opening day ended without any gunfire despite seeing about 40 geese during an afternoon hunt. This was a small farm pond that I know well, and hunted over during previous seasons, so much so that I use a game cam to help me scout the exact time the geese arrive. My big foot goose decoys were deployed and a balmy 94-degree temperature once again proved that I must love this sport to be in the field rather than in the pool somewhere. A watchful waterfowler keeps his eyes peeled for the next flight of geese. The hot afternoon weather sparked a thunderstorm in my area and I was in a wide open field, monitoring the radar via my iphone. About 5 p.m. a crack of dry lightening struck ahead of the storm, causing a nearby longbeard to shock gobble ten times in a row. This storm was no joke and I immediately headed for the safety of my truck. Pouring rain and strong winds were upon me by 5:15, and then here come the geese. They were exactly on schedule, acting immune to the weather, and just like that my hunt was a total bust. 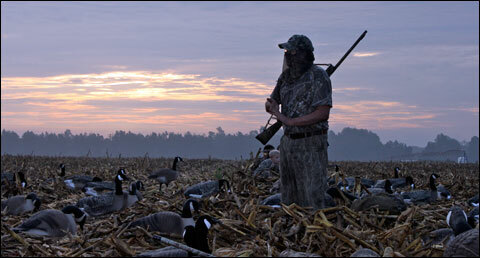 Undaunted by that result, I soon joined friends for a morning goose hunt. The freshly cut 80-acre cornfield had become a magnet for geese and brothers Shane and Chase Wiles had been watching them to pattern their movements. The author (left) with Hugh McLaurin. 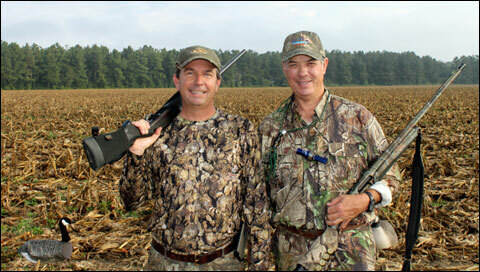 Hugh McLaurin, maker of Big Lake goose calls, and I were guests on what was otherwise a family affair type hunt. The brothers called the shots for this hunt and they brought along their parents, their niece and cousins and we ended up with eight guns and two videographers for the hunt. With three generations of Wiles in the field together before dawn, this hunt was already one to remember. 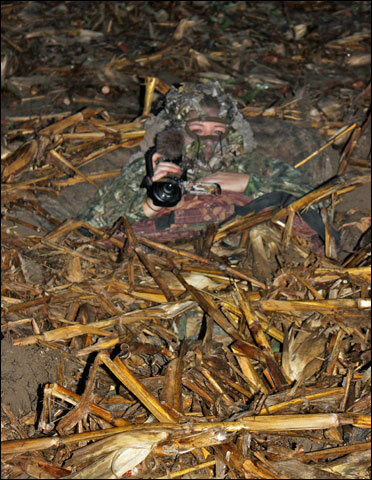 Videographer Jenni Wiles is hidden in the corn stubble. Early morning light shows that the first volley found success. The hunt set up got underway at 5 a.m. with two spotters using different points in the field to make sure that they identified the ‘X’ where about 100 Silo Socks decoys would be deployed. 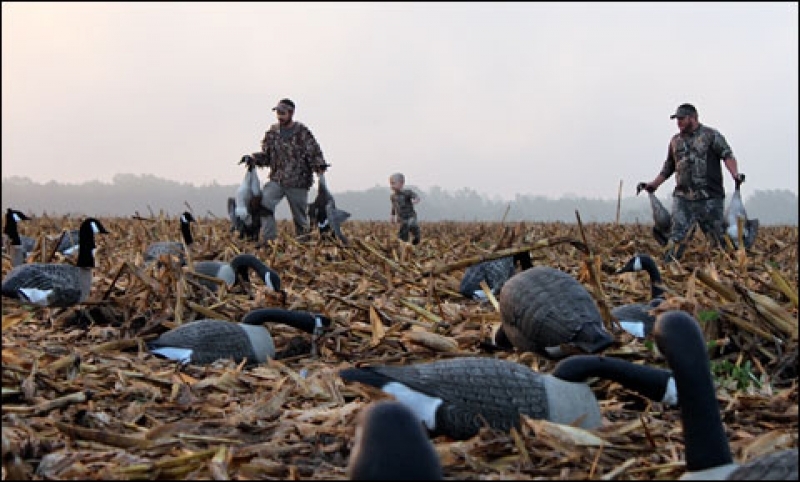 With no ground blinds on hand, the Wiles crew broke out several shovels and rakes, giving instructions to dig a hole to lie down in, and then to use the rake to gather enough corn stalk debris to totally conceal their presence from the geese that would soon be overhead. Shortly after daybreak the phalanx of waterfowlers could hear the approaching first flight of honkers well before seeing them. The only motion allowed at this point is the use of decoy flags to create the illusion of movement in the decoy, and with no predominant wind in play, it would be tougher to know exactly how the geese would approach. However, the first group of eight geese came straight in, almost landing on cousin Jenni’s head while she was making video. 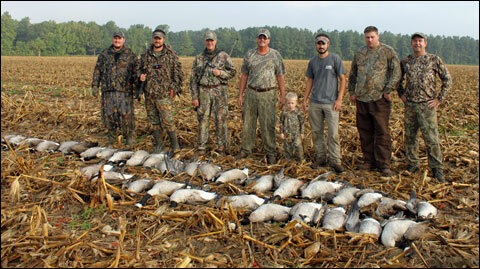 At least five honkers were harvested and confidence for a good hunt was growing. Some of our hunters pause after the initial gathering of harvested geese. The next flight of geese had other ideas though, and came into the decoy spread from the opposite direction. A few more geese were harvested but the decision was made to turn some of the hunters around in their hole to guard against more slippery maneuvers by the geese, which almost always prove to be worthy adversaries. Scouting had revealed a large flock of geese, and as each minute passed we wondered if they would be flying in soon. Just then, we saw three long flocks of geese on the distant horizon and they were coming to the ‘X’ and we were ready. It’s always tough to practice patience and not shoot while the first geese pass overhead, but with eight guns the best chance to fold up some birds will come when everyone is shooting. With the smell of gunpowder coming from our shotguns, a total of 36 geese were picked up and celebrated in that cutover cornfield. No retrievers were utilized this day, since a wounded goose has nowhere to escape to in this open terrain. All of the meat went to the Wiles family and their fortunate friends.